The Amur tiger is listed as Endangered and is on Appendix II of the Convention on International Trade in Endangered Species of Wild Fauna and Flora (CITES). 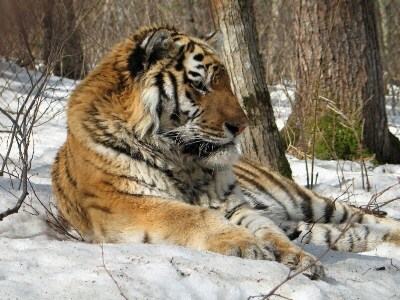 The primary threats to Amur tigers across their range are anthropogenic impacts on tigers themselves and their habitat. Tigers are commonly perceived as a source of money by poachers, as competitors for ungulates by hunters, and as a threat to personal safety by local people. The goal of our project is to influence attitudes of local people their relationship with tigers by working with children and school teachers living in tiger habitat, thereby creating a future for tigers. We will conduct educational activities aimed at young people. Training and seminars will be held separately for teachers to better facilitate working with the materials we develop. To assess changes in attitudes of school children and teachers towards tigers, we will use three sets of questionnaires. We expect student and teacher attitudes towards Amur tigers to improve and that their interest in Amur tiger conservation with grow. Teachers will independently continue to provide tiger educational programs for students. Through this project we hope that we can develop a model for student education in remote villages of tiger that can be replicated elsewhere in the Russian Far East.